Give prominence to the E-Pak parent brand, while still highlighting its individual divisions. As you can see in the brand guide, a reworking of E-Pak’s logo, typography, colors, and photography readily achieved the first two goals. The third, however, proved to be more of a challenge. Traditionally, E-Pak has relied on separate colors for differentiation between its product lines and divisions. These colors, while effective at creating clear division, also completely muddied and overwhelmed E-Pak’s signature red hue, negating any visual brand reinforcement in its materials. Additionally, red was also used as a division color, causing further visual confusion and blurring the lines of the core identity. Part of our task was to update these color choices to bring a new, fresh feel to the divisions, as well as to create a system where it would be clear to the viewer that E-Pak’s Red was the parent company, and the secondary color represented the division. We started by updating E-Pak’s signature red color to bring a brighter, more impactful tone to the brand. We complemented this red with black and grey, creating a core aesthetic that is intense and stands out. We then turned our attention to the divisions, looking for other colors that matched the existing divisions while feeling harmonious with this new, vibrant red. In application, however, these colors proved to be less than ideal. Regardless of how much or how little of the division colors we utilized in a design, their vibrancy always seemed to conflict with the E-Pak Red. They also distracted from a clean, minimal look for which we were aiming. It became clear that in order to meet our three goals for the brand, we’d have to find another solution. We turned to iconography, and with E-Pak’s help, we selected an object that would be used to represent each division. With these objects in mind, initial sketches were done to explore form and style. A geometric, angular approach was settled on to reflect the rigid & sturdy nature of E-Pak’s products. Additionally, we explored several options for “badge” shapes, in an effort to standardize the dimensions of the icons and make them usable as a flexible system instead of a disparate group. Once the initial explorations were complete, the hand sketches were scanned and work began on the computer to iterate, refine, and further develop the icons and badges. 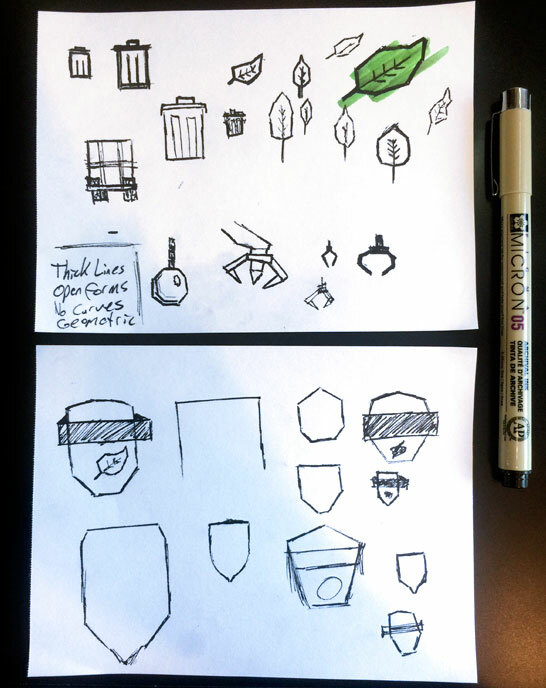 Early drafts of the badges were essentially complete, but ultimately rejected for feeling too authoritarian (the shape was reminiscent of military badges) as well as having too much of a retro flair that didn’t feel right for the forward-thinking brand. 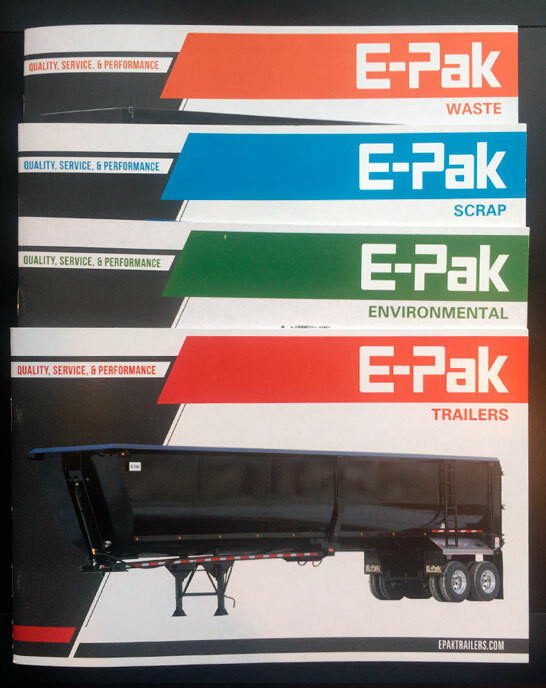 A simplified rectangular shape was selected for its ease of application and rigid construction, as well as its ties to E-Pak’s product line of boxes, tanks, and trailers. Further refinement of the icons continued, and an engineering-inspired dot grid was worked into the background of the badges, giving them a subtle dimensionality. Finally, utilizing the newly established E-Pak typography, the division names were set in consistent fields of E-Pak Red, striking the right balance between division identity and parent identity. At the end of the process, we had essentially crafted five unique logos, so we generated the standard assortment of color and file-type variations for easy application across print materials, the web, and more. We also updated the brand guide with some specifications on how to appropriately utilize the files, both as the full division badge and as the individual icons. With the division badges finalized, it was time to begin the roll out of E-Pak’s new visual identity. The first piece we’ve created is the direct mail postcard below, and there are plenty more materials on the way. 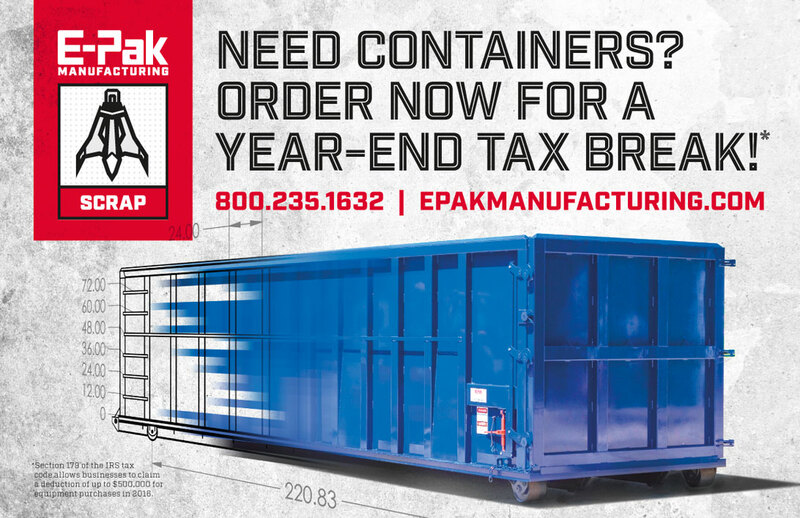 Equipped with a striking new visual identity and a system for effectively applying it, we look forward to our continued relationship with E-Pak Manufacturing and the opportunity to help them further shape their identity in the coming months. « Was it Inspiration or Plagiarism?